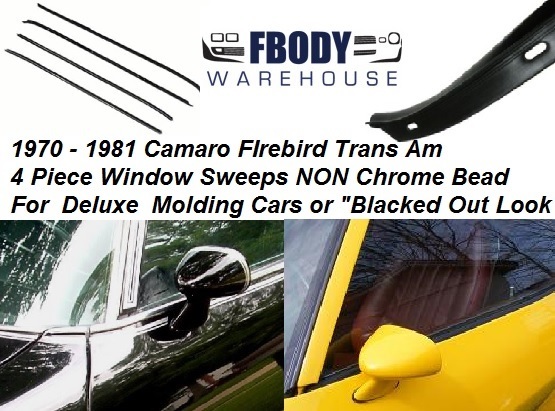 This is is a 4 pc piece set of non chrome bead outer window sweeps for 70-81 Camaro and Trans Am. This 4 pc set also comes with the door panel mounted inner window sweeps as well. DELUXE MOLDING PACKAGE: If your car has the thick chrome hood wrap, fender tips chrome accents and the door top belt molding which is held onto the door via a series of clips this is the style you will need. The video below shows this Deluxe Package on a 70's Firebird. If you are not sure if your car has the deluxe package please watch the video below. BLACKED OUT LOOK: Also note you can install these as shown in the picture on a car without the exterior body molding and eliminate the chrome bead on standard issue cars if you are looking for a smoother "blacked out look"
WORLDWIDE SHIPPING AVAILABLE ON THIS ITEM.